Most people tend to think of elective cosmetic procedures when they think of dermatology, laser and vein treatments. It’s easy to forget that many people live with skin issues that can be uncomfortable, painful, embarrassing, or even put them at risk. In speaking to patients who constantly deal with renegade skin, we heard that it can make them feel like their skin almost doesn’t feel human. We used this insight into the emotional hardship of skin issues to try to offer up some relief, inspiration and motivation for people to get their skin afflictions under control. 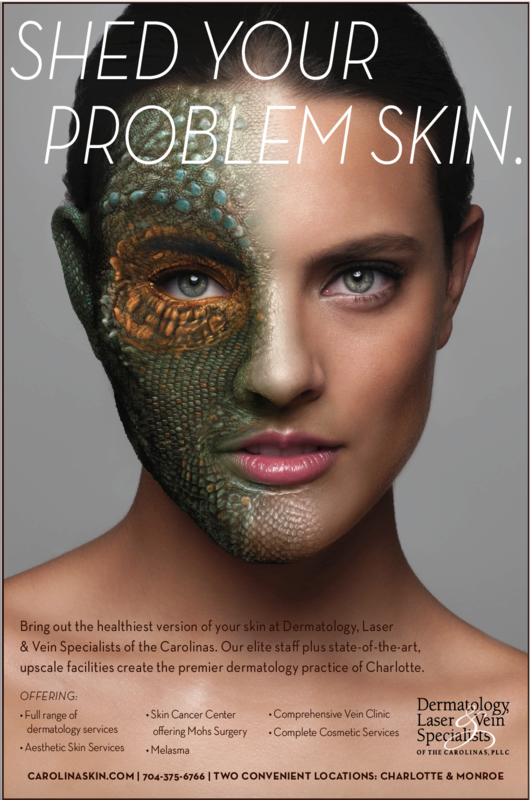 The truth is that the trusted, incredibly attentive physicians at Dermatology, Laser & Vein Specialists of the Carolinas, can treat skin afflictions of all kinds, often brining relief to patients who thought they would never get their skin issues under control. Our hope with the campaign was to metaphorically represent some of the more common skin problems people have with a representative animal kingdom hide and then show that animal look giving way to the natural human beauty underneath. So far the campaign is getting a lot of attention, as calls and appointments have increased significantly since ads began running. The social media has been especially effective, engaging fans of the practice’s page, creating some great comments and ultimately driving people to the practice’s website to learn more. In the end, beauty is what’s inside, but it also doesn’t mean you necessarily have to live with the skin you were born with. DLVSC enables patients with unruly skin issues to tame their skin, and the team did a great job bringing this to life.